"The Truth . . . in accord with fact or reality"
Marijuana, is a narcotic drug which is present in the sap of the hemp plant. It is sometimes called hashish. Marijuana is found in the sap of the female flower and the leaves. The flowers and leaves are sometimes dried and rolled into marijuana cigarettes. Smoking marijuana cigarettes or taking it in other ways produces undesirable effects on the body. While under the influence of marijuana, users react by showing mild exhilaration and even resorting to violent crimes, almost as if insane. It has no value in medicine. Marijuana has been used as a narcotic for many hundreds of years. Marijuana smoking first attracted attention in the United States in New Orleans about 1910. It has since spread alarmingly in the United States, and much crime and juvenile delinquency is claimed by some to have been traced to its use. In 1937 a Federal law forbade selling or distributing marijuana. Federal agents now help state and local authorities in their efforts to stamp out the use of the drug. Marijuana - mar uh WAH nuh, is a narcotic drug that exists in the sap of the hemp plant. This plant grows in almost all parts of the world. Marijuana is sometimes called hashish. Dried hemp leaves may be rolled into narcotic cigarettes called reefers. People in the Orient often put marijuana into candies and medicines. However, the drug has no value as a medicine, and is extremely habit-forming. Marijuana has undesirable effects on the body, no matter in what form it is used. The user loses mental and sometimes physical control of himself, and may commit violent crimes. Marijuana users often become so devoted to the drug and its effects that they lose interest in any useful or intellectual occupation. Probable one of the greatest dangers of marijuana is that persons who use it soon look for stronger drugs, and often become addicted to heroin. 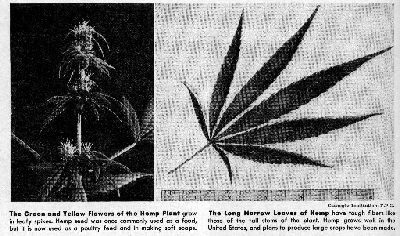 HEMP: is a tall plant that provides useful fibers for making rope and cloth. It is raised in Asia, where it originated, and in Europe and North America. Growing Hemp. Hemp is an annual plant. Some kinds are grown for their seeds, and some are raised for their fiber. Both seed and fiber hemp have their pollen, or staminate, flowers on different plants from those that produce the seed, or pistillate, flowers. The pollen flowers are yellowish green and grow in large clusters. The smaller, less colorful pistillate flowers bloom later. Fiber hemp can be sown simply by scattering the seed on the ground. Each seed grows to a single slender stem from 4 to 12 feet high. Fiber hemp is harvested when the pollen flowers have fully blossomed. Seed hemp is planted in furrows, or drills, with earth covering them. The stalk reached a height of 10 to 20 feet. It is thicker than the fiber-hemp stalk, and has many branches. Hemp grows best in a moist, mild climate. The soil must be kept well drained, fertile, and free of acidity. The rich loamy soil of the Kentucky bluegrass region is well suited to it. In California, hemp thrives best in the fertile soils of low-lying lands along the rivers. Hemp is harvested in the United States by reapers or harvesting machines that mow the stalks and spread them in even layers at the same time. After the long stalks are gathered, the hemp fibers must be removed. The fibers consist of many strings of long cells knitted together. They lie in the inner bark along the stem and must be separated from the bark, vegetable gums, and woody stem around them. To free the fibers, the stalks are either soaked in soft water or hung up in the open, where they are exposed to the weather, especially to the action of dew. This process is called retting, or rotting. The water or the dew makes the matter around the fiber become rotten, so it can be removed easily. Italian hemp makers use the water-retting method and produce the finest hemp in the world. Their fibers are fine, lustrous, soft, and creamy white. American hempgrowers use dew retting, which produces grayish fibers. It is cheaper than water retting. When the material around the fibers rots enough, the stalks are beaten and crushed with a heavy wooden club. The fiber is freed from the stem and cleaned roughly. The rough fiber is tied into bales and sold. Uses. Hemp fiber has great strength, and makes good rope and cordage. Twines, carpet thread, carpet yarns, sailcloth, and coarse sheeting and toweling are also made from hemp fiber. The waste fiber, called oakum, is often used as calking. Some hemp is used in papermaking. Hemp seeds are used as bird food as well as a source of marijuana, hashish, and oil for soaps and paints (see Hashish; Marijuana). A cordage fiber called manila hemp is made from the abaca plant. Officially quoted as saying, "It's Laughable to Think we will Apologize", Dale Jacobs (present day editor of World Book Encyclopedia) made it very clear. "NO APOLOGY" for World books role in the Reefer Madness campaign. - see example (following) taken directly from the encyclopedia. Marijuana has been used for many hundreds of years. Its use has spread alarmingly in the United States since about 1910. Today, a federal law makes it illegal to sell or distribute marijuana. The Federal narcotics Bureau reports that most of the marijuana used in the United States is brought in illegally from other countries. Walter Modell See also DRUG HABIT; HASHISH; HEMP; NARCOTIC. The Reefer Madness Campaign (of which the above is an example), was responsible for shaping the public perceptions and mind sets of numerous individuals against Medical Marihuana and it's use by Cancer Victims. World books editor Dale Jacobs however, was quoted as saying, "[Our] Encyclopedia back then and now, is a reputable, well respected institution" . . . "The 1962 edition reflected how medical experts and scholars perceived the topic 38 years ago." Mr. Jacobs, had previously been informed that Marihuana had been in use as medicine for hundreds of years and that this was well documented at the time. He was also aware that the time period in question was the 1960's not the 30's. It's hard to think that anyone back than with half a mind could have believed that, --- Medical Marihuana was an (extremely habit forming) dangerous narcotic, with no medical value, that makes people commit violent crimes and loose mental and physical control over their bodies. The effects of the Reefer Madness Campaign are still evident today, there are still numerous Americans out there that really believe, that 'The use of Medical Marihuana by Cancer Victims will automatically lead to a life of drug addition and depravity".